Sorry, I had deleted it from my Dropbox. 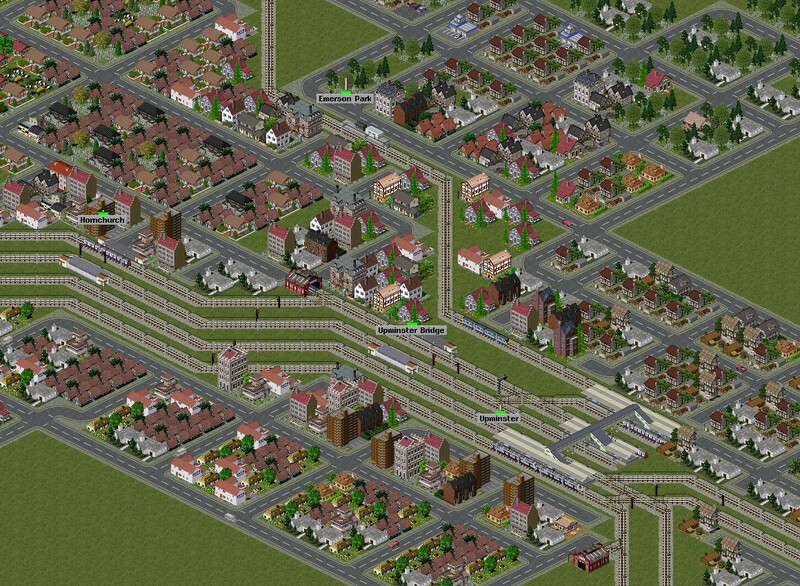 -- Bigger scale -- 118 metres per tile, which allows for all stations and tracks to be built. 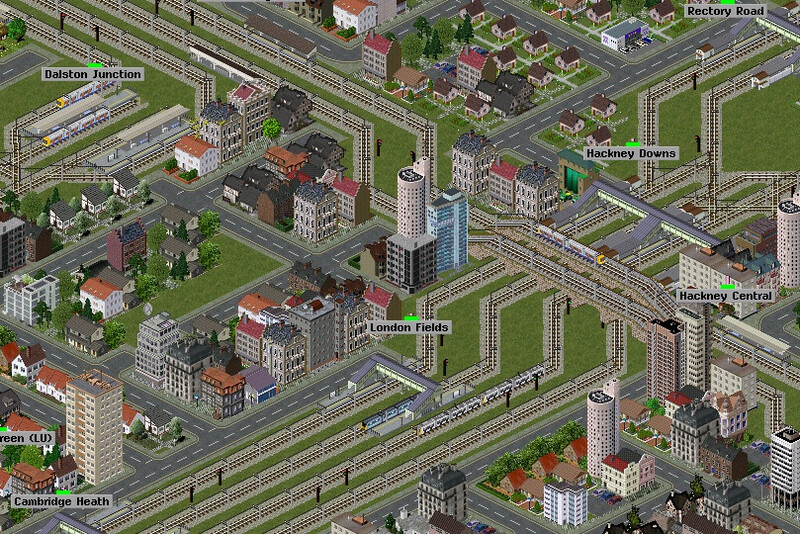 It also means that the map is 4200 x 8600 tiles and consumes 1.5Gb of RAM so far! I'm not sure how well it will run when there are actually trains operating, but we shall see. -- Since Experimental has come a long way since I made the last map, I'm hoping I'll be able to simulate as close to realistic running as possible on each line. When the next version of Experimental is released, I'll be able to start operating train routes. (The new braking physics features are required for this to work properly at such a big scale). I've been experimenting with the upcoming version of Experimental, which is what will allow me to properly proceed with this map. Here's a video capturing half an hour at Colchester, with trains appearing as they would on an ordinary Monday-to-Friday off-peak schedule. I recommend you switch to large player and turn the resolution up, or you'll need a magnifying glass! I'm excited to work more on this when the new version is finalised! > I haven't taken any time to paint the trains yet, but they do all have the relevant .dat file stats, which is required for them to run to time. Here's another video of rather higher quality from my above testing -- a journey from Clacton-on-Sea to London in four minutes. Our service makes all the stops you'd find on an ordinary timetable, and arrive in almost exactly the timetabled 85 in-game minutes. (Sadly you can't see the time indicator as I'm not recording fullscreen). 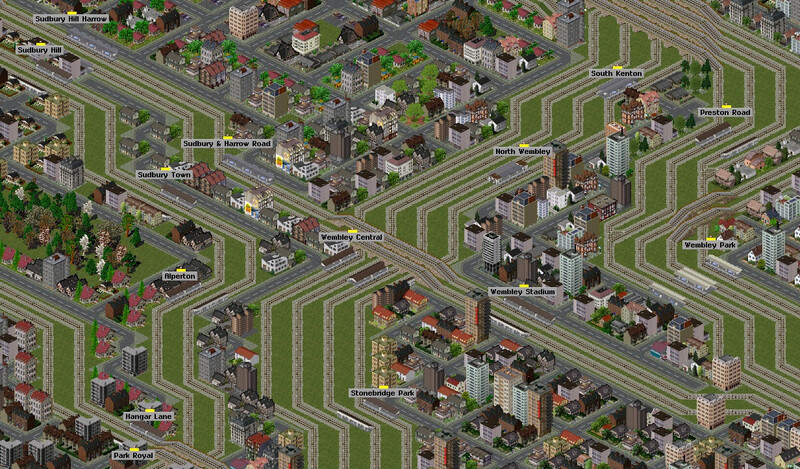 There are lots of work-in-progress elements here: missing roads and trackwork, cities which need tidying up, etc. But this video gives a good sense for the map. Please can you re post the link to the pak folder (in your first post), it doesn't seem to be working. Note that the performance of the old map will be pretty unsatisfactory in the latest version of Experimental, since the vehicle physics have changed since I made it. When the new version of Experimental comes out (any time now, hopefully) I'll be spending some time developing my new version of this map. This one features services to Shenfield, Chingford, Enfield Town and Cheshunt. As ever, what you see reflects a real daytime off-peak timetable. You'll notice (from the annotations) that the Shenfield arrivals are a little early, but everything else is more or less spot on. Of course, Liverpool Street has more than four platforms: the rest are underground for space reasons. Because the scale is 118 meters per tile, it wouldn't be possible to have all the platforms above ground. I'm hoping to make a different kind of video soon: a "video diary" type thing in which I give a tour of the map as it stands and talk about how it's been made and where it will go next. The track layout on the Tower Gateway branch of the DLR is not accurate. After the Bank branch was opened Tower Gateway was served from a single lead junction, and more recently still the station has been rebuilt to only have one platform track (but two platforms). I'd love such a video-diary! Showing the complexity of the network and the connexions. That's where the real beauty lies for me, when the subject leaves the pure aesthetic and my mind forms it's own representation of the complex system. ps. : this just made me wonder if the term beauty is correct, as it may apply only to aesthetic beauty. The representation in my mind can hardly called aesthetic* anymore, since it is beyond sensing already. Unless i would consider the transfer of information in my mind as sensing. First thought was the appreciation of abstract art, where one might appreciate the representation in one's mind, thus seeing no conceptual difference, which would most likely fall under aesthetic. Third thought everything sensed requires a mental representation. Fourth thought, there is a fundamentall difference in my own perception of the matter when looking at a non-abstract photo and the mental representation of a complex system. Let both have the same degree of appreciation by me, i consider the former as mostly reception the latter as mostly forming the mental representation. Degree of conscious evolvement is different when forming both mental representations. Reflection on this: for the picture the medium is important, i would not appreciate the beauty of it when reading a good description, i can get the beauty of the complex system regardless of the medium -- as long as i can understand it. pps. : mostly wrote above to structure my thoughts, decided not to delete it, since the people here might understand why i can consider the complex system to be beautiful (while i doubt it is the right word). *WP etymology: αἰσθάνομαι (aisthanomai, meaning "I perceive, feel, sense"). Ah, thanks Kieron -- looking more closely at this document I see that I had misread the entry and exit platforms facing the single track as being two platforms for two separate tracks. 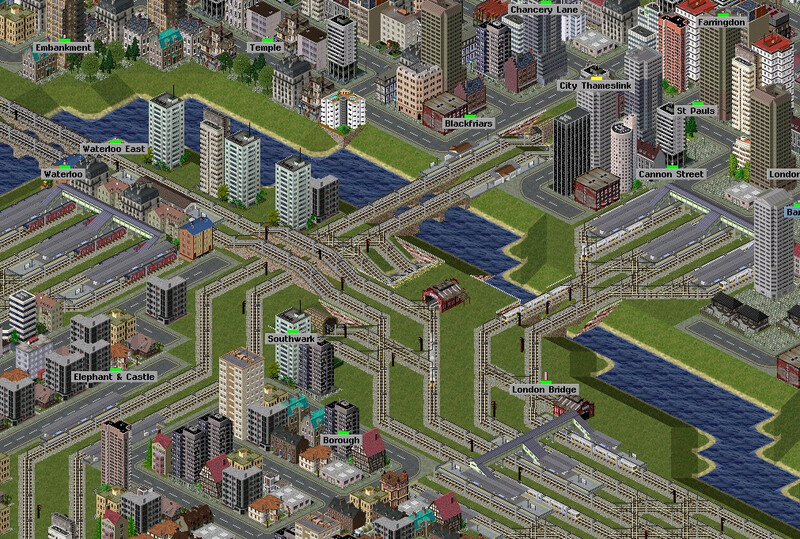 I agree completely -- that's the main appeal for me of wanting to simulate real systems, networks and passenger flows. I'll get to work on the video diary soon. We see tube trains at Barking and Upminster, too. Note that tubes are limited to four cars since in central London there is only room for two-tile long underground stations. Here's the first episode of the promised video diary, in which I introduce the map and talk mainly about two things: first, how it's different from my first attempt at a GB map in Simutrans, and second, the various kinds of data that I've used in making the map. This screenshot is of the Richmond area. 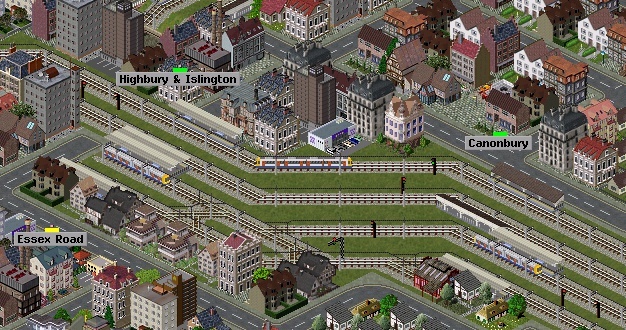 I'll probably have to add another bay platform at Richmond station once I add the London Overground services. At some stations I've omitted platforms which are not in regular off-peak use. Richmond seems to have five bay platforms, but I think I'll only need four. Also, to give another example, I think that the new bay platforms at Blackfriars are only used by peak-time services, so I won't be building those -- which is just as well, since that area is quite crowded! Very well done! Great video, wonderful view of your city thusfar. Can't wait for the next one! That's not a small project. Kieron was joking -- my accent is definitely not Aberdonian I've only lived here for six months, so the accent has yet to take hold! This is incredible! Shame that virtual undertakings are so hard to see... When finished, this would deserve (or rather generate?) some publicity (giving Simutrans some spotlight as well ). At least public transport people should be interested! Come to think about this, why is it that the program feels... normal, while the world created in it amazing? That's not fair. In "real world", cakes can be seen, even made, as James can confirm. But we were taught that cake is a lie. The rest is an exercise for the reader. This is Highbury & Islington, whereOverground trains from Crystal Palace and West Croydon terminate -- allowing passengers to change for North London Line services to Stratford, Richmond and Clapham Junction. All services are operated by Class 378 'Capitalstar' trains. Londoner here. I used to frequent these forums a lot, but popped on earlier today to see how things were going as I somewhat dropped off, but I must say that this is *amazing*. Awesomeness of this simply cannot be explained. Your videos, drawings and explications about your map are very fascinating to watch. It must have taken a lot of time to make that and I think your work inspires me to introduce in this section my own map of Paris. Thank you both for your kind comments! Isaac, I'm sure that many of us would be very excited to see similar content from your Paris map -- go for it! The screenshot is of the southern part of this line at Hackney Downs, where the line crosses the North London Line from Stratford to Richmond (etc). I have another video almost ready to go discussing the scheduling and timetabling features at work here. I'll release that in a few days. Another video, hot on the heels of the last, in which we discuss how the timetables and schedules work on this map. I also give a general overview of the progress that's been made since previous videos. 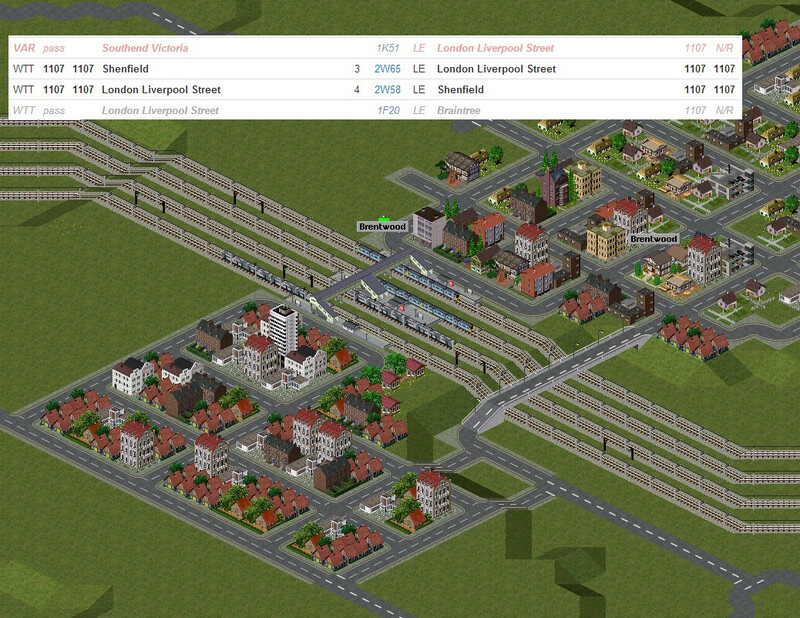 Screenshot from the Cannon Street/London Bridge/Waterloo area, where services have been taking shape. Very impressive, I love watching these! You've done a marvelous job with your modelling. Your game seems to be running fairly smoothly still despite the enormous map size. The map still runs very smoothly -- I'm only recording at 10fps here so it's actually even smoother than shown in the video -- and I can still fast-forward up to 30-35x normal speed. That said, performance is my big worry on this map -- I'm concerned that it will be unplayably slow towards the end. I'm not worried about the number of convoys, since I don't think there will be many more than on the previous version of the map, and that still ran acceptably even when full. 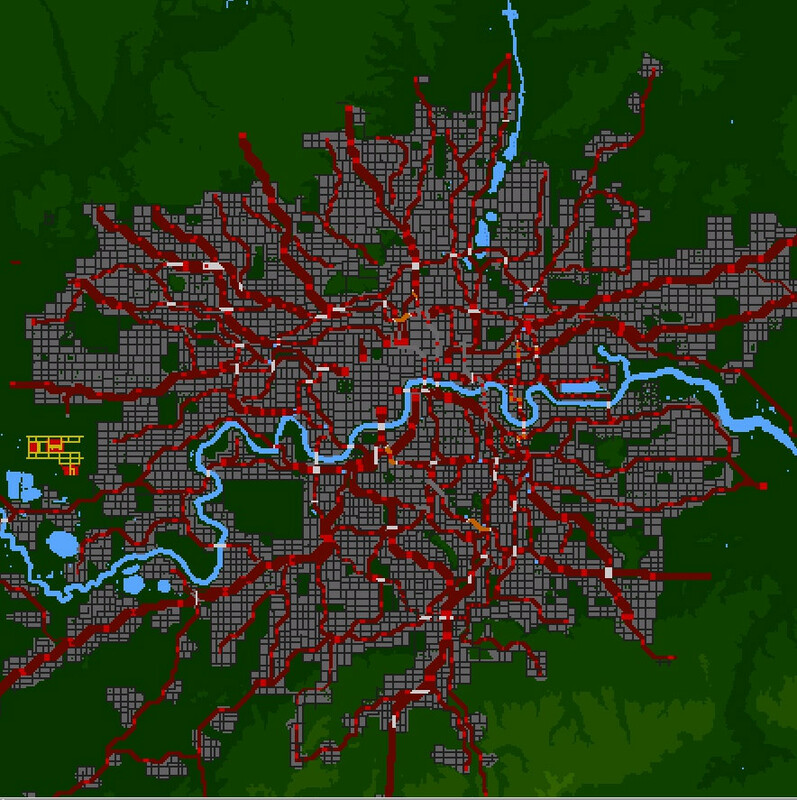 (Also, I think about 1/4 of the total convoys are already on this new map -- since the frequency of London Underground trains means that they take up a surprising proportion of the total convoys). 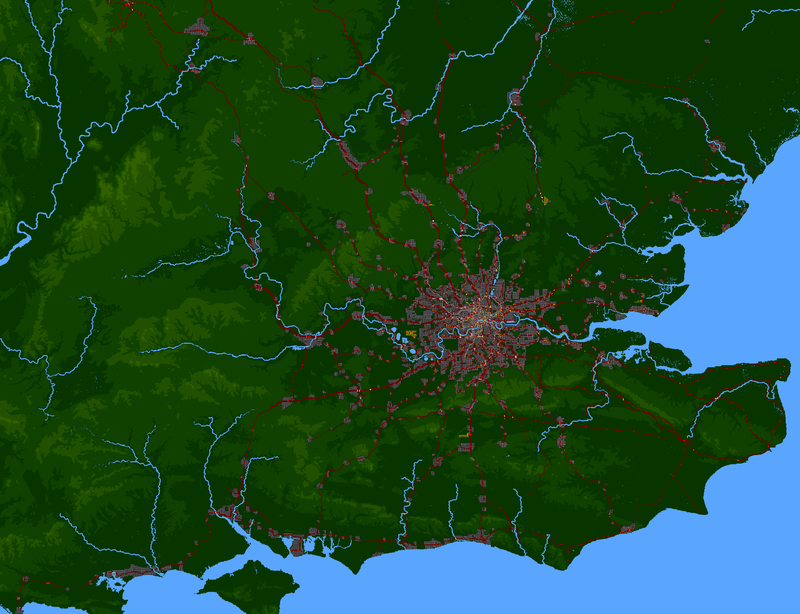 But the population and passenger levels are likely to be much higher on this new map, and it's this that might kill performance. We shall see. how often have you exchange the vehicle in the game? Hi greenling, what do you mean by "exchange"? The word exchange it a another word for replace. Or if you mean how often do I have to use the "replace" function in-game, the answer is never -- I've set it up so that I don't have to use that. First, a quick one I grabbed by accident with four trains passing at Brentwood (on the London-Colchester line). On checking the timetable I was pleasantly surprised to find that all four trains were indeed meant to be passing here at exactly that time! I continue to be amazed at just how accurately it is possible to model the network on this map -- this is a testament to how far Experimental has come in recent versions. The top-most two trains are the London-Shenfield trains, and the other two are the Braintree and Southend trains.